LISTEN TO THIS BY EMILE GRIMSHAW. ARRANGED BY RON HINKLE. BMG. BACK ISSUE. SUMMER 2018. Location: /BMG Magazine/BMG. BACK ISSUE. SUMMER 2018. Frails and Frolics CD: Review by David Cotton. Hellys International Guitar Festival: Sam Tremain. Plectrum Guitar Technique 12: Mike Chapman. Narciso Yepes DVD Review: Allan Brace. Sweet and Low (Mandolin) Sir Joseph Barnby, arr. Johnstone. The Lost Diamond (Guitar): Peter Pope. Royal Hawaiian Hotel (Steel Gtr) arr. Maurice Hipkiss. Ben Cotton’s Clog Dance (Banjo) transcribed by Alan Middleton. Steven Shaw Guitar Gallery: Anthony Lis. C.E. Tenor Banjo Down Under: Paul Carey. Midnight on the Water (Bluegrass Mandolin solo). Bluegrass Banjo 29: David Cotton. Ken Perlman Interview: David Cotton. The Banjo Story 25: A.P. Sharpe. Fun with the Ukulele: David Cotton. 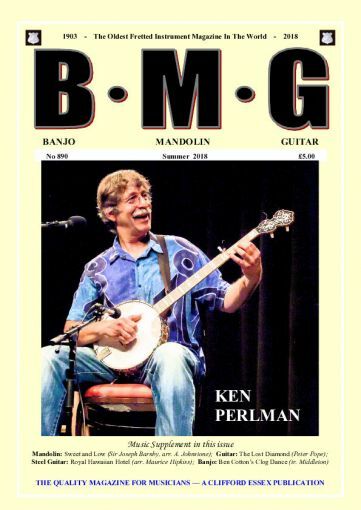 Our cover feature is an interview with Ken Perlman, one of the world’s finest exponents of clawhammer banjo. You can read the interview on page 58, and a review of his long-awaited new CD on page 37. Many readers have expressed interest in the differences between classic, clawhammer and bluegrass styles. Classic (aka ‘classical’) banjoists play the (five-string) banjo with bare fingers, never using fingerpicks or capos. They use their thumb and three fingers to pick the strings, which are generally made of nylon or gut. They play melodies in a variety of key signatures, and in traditional classic playing you’ll hear a strong ragtime influence. They tend to play from sheet music rather than from tablature, and use open-backed or zither banjos: the latter have a tunnel under the fingerboard from the fifth fret to the peg head to accommodate the fifth string). Bluegrass players use a plastic thumb pick and metal fingerpicks on their index and middle fingers. Strings are metal and the banjo usually has a resonator to amplify and project the sound. Traditional players tend to restrict their playing to the keys of G, D and C, or use a capo for other keys with a sliding fifth string capo, or ‘railroad tacks’—the little nails used to hold down model railway track—under which they hook the fifth string to play in other keys. Traditional bluegrass is based on arpeggiated chords with pull-offs and hammer-ons used to play notes which don’t appear in the fingered chords. Modern bluegrass playing has seen some astonishing developments in a relatively short time, with progressive players branching into jazz, fusion and other styles. In both classic and bluegrass playing, the thumb picks downwards and the fingers pick upwards. In clawhammer (aka frailing), the picking finger picks downwards and the thumb provides a rhythmic, sometimes drone-like effect on the fifth string. Clawhammer players traditionally accompanied songs, but modern players have adapted the style to play note-for-note traditional fiddle tunes and ragtime pieces.